Montbretias belong in the the Iridaceae family of bulbs, the Crocosmias having originated in Southern Africa. 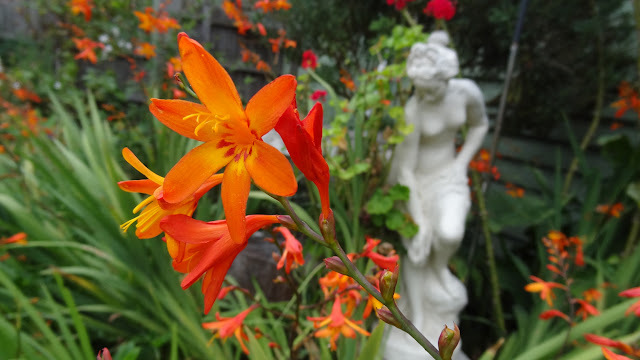 Montbretia is a hardy member of the Crocosmia group and is very easy to grow. Crocosmia × crocosmiiflora (Montbretia) is a garden hybrid of C. aurea and C. pottsii, first bred by Victor Lemoine in 1880. The variety illustrated here is ‘His Majesty’. The orange flowers are trumpet shaped and appear alternately along the stems. The leaves are long and narrow.This is one of the few summer flowers in our garden that make a pretty display and can grow wildly. Some people call this a "wild gladiolus", but the wild gladiolus is pinkish in colour. Please join me for Floral Friday Fotos by linking your flower photos below. Such a vibrant orange in both dark and light tones! And love the classical statue in the background too! I love this photo and had only downloaded some wild ones from my camera a couple days ago .........was thinking of them for a floral post. They are very eye-catching but not such good news when they escape into the bushland. Lovely! These flowers we actually see here regularly. Great capture and glad to be here! Welcome to FFF, Emilie, but your link is not working. Would you kindly reset it? but I don't know how to remove link no.4 at your blog? Lovely flower. This plant is not a common sight up here. Have removed the pesky word verification requirement! With thanks to Sallie for alerting me to it being turned on! º°❤ Essas flores são lindas, a cor delas transmite muita alegria. Uma festa para os olhos. Thank you for your kind comment on our new home. They look beautiful here, but they can become pesky in the garden!